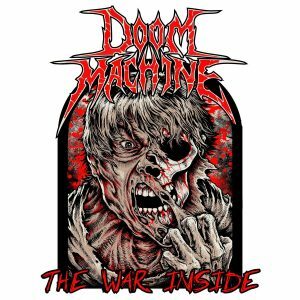 Part of east coast metal’s 10-year club, the Annapolis Valley trio Doom Machine returns with their fifth album “The War Inside”. This album shows the band in a very comfortable spot in their sound and has balanced the dosage they mix traditional, thrash and stoner metal elements with their overarching theme of doom metal. The album starts with its lead single “Disasteroid”, which is accompanied by a video which parodies CNN, Trump quotes and fear mongering. The tune itself is a bass-heavy anthem which has the classic slow-burn of the doom/stoner genres accompanied by a sonic guitar line paired with the Maiden-esque tones from vocalist Bill Arsenault. We then transition into the chunky groove of the track “At Last….WE REIGN”. The vocals on this track bounce between the previous anthemic tones with gravel-filled growls that trail in at the end of each phrase of lyrics. The riffs become more chopped up as the track ramps up with a vengeful thrash vibe with shredding guitars on the songs final kick. Next is the instrumental “Amaranantha/The Next 1000 Years” which begins with a prog-based intro layered with a brief splash of piano which builds into a series of chord progressions and solos that worship the alter of Black Sabbath. We then hear the track “Scarecrow II: The Fallen”, which is a sequel to the track “Scarecrow” off their previous album, that is chock full of apocalyptic overtones. The albums title track comes in with a circling, crunchy stoner riff that makes you want to stomp your feet. Arsenault’s raspy growls really blend with the guitar tones to give the music some bite. “Just Like You” is the most peculiar track on the album. The band blends chord progressions derived heavily from AC/DC with their signature tone to give the classic sound some extra muscle. The lyrical content branches into a very personal narrative about being the bigger person and are delivered with a lot more angst, most comparable to Twisted Sister. While this track is an awkward fit within the rest of the album, the experimentation should be applauded. We resume the album’s trajectory with the track “Rising” which serenades the losers and cheaters of the world. Again, we hear a lot of low-end on this track and of course its previously mentioned solo which soars off an impressive, well-pitched note from Arsenault. The album continues its dark attitude with the track “The World Burns” with robotic vocals that provide a canon harmony on the chorus and imagery of the complacency we display towards global issues. “Against The Grain” follows with another heavy, condescending riff that is layered with creepy synths, complemented with defiant vocals. The album ends with “Ascension” which clocks in at just over 10 minutes. It brings back the element of piano on the album, this time in layers, fading into another spaced out intro before tightening into its full rhythm. The track follows a downward spiral; dropping, or rather ascending, further into a dark place. This reflects in the lyrics with lines like “These chains cannot bind, but they cannot free me.” The piano from the intro bubbles to the surface again, chilling your spine once more before its conclusion.